Industrial Metal Detector can detect metals using an electromagnetic induction method. The Das Electronics manufactures Industrial Metal Detector. 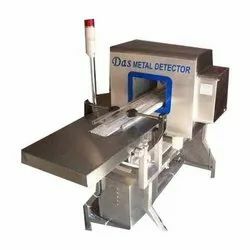 Das Electronics offers a wide range of metal detectors like bag metal detectors, capsule metal detector, gravity feed metal detector, Online metal detector, needle detector and tablet metal detector. This range of products finds application in various industries like food and beverages, pharmaceuticals, garments, plastic processing, packaging industries and other industrial organizations.